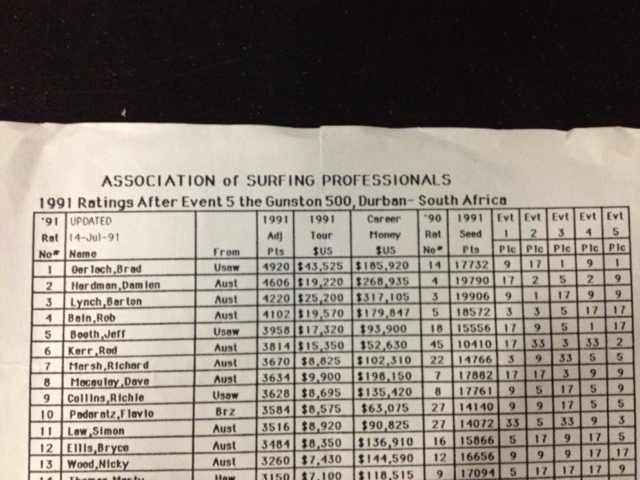 Ever since I finished the 1991 season on the Asp world tour I have been labeled a former number 2 surfer and I’ve been fine with that… Sort of… I don’t see myself as bitter or all weird because I didn’t win the world title… guess that’s not for me to decide hahaha. Ok at least I don’t feel weird. Anyway, I was watching tennis with bobby martinez the other day (not) and heard the commentator talking about a former number one player. So I started asking how that worked and I came to find that if a player held the number one spot at any time in his or her career than they were forever labeled a former number one. Mmmm that seemed cool to me because it was a fact. The other day I was cleaning a storage unit and found the 1991 ratings sheet. Haha proof! I am a former number one! Seems I should know that but the number 2 was seemingly beaten into me I guess. So for all those surfers that held the number one spot, even for a week, give yourself the credit man! Now I got to find the 1986 ratings sheet. Good for you! Still a bit of a fan after many years. Just saw you beat Pottz at the 2014 Hurley Pro Heritage Heat. Great style, Brad!